A file upload is a great opportunity to XSS an application. User restricted area with an uploaded profile picture is everywhere, providing more chances to find a developer’s mistake. If it happens to be a self XSS, just take a look at the previous post. Basically we have the following entry points for an attack. The filename itself may be being reflected in the page so it’s just a matter of naming the file with a XSS. Although not intended, it’s possible to practice this XSS live at W3Schools. A PoC (Proof of Concept) is available live at brutelogic.com.br/poc.svg. As we can also see below, the file UNIX-like command along with the PHP functions exif_imagetype() and getimagesize() recognize it as a GIF file. So if an application is using just these to validate the image, the file will be uploaded (but may be sanitized later). 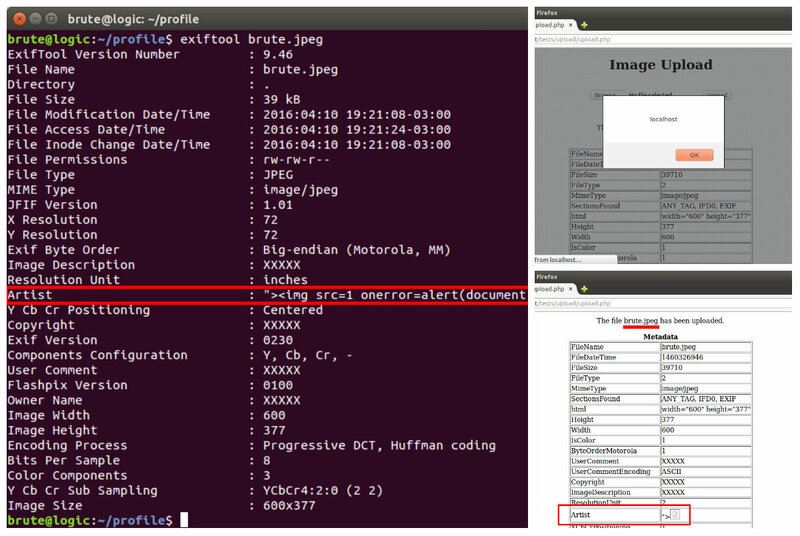 There are more elaborated examples of XSS using image files, usually bypassing filters like the GD library ones. A good example of that is here. It’s an issue with the quotes. Type them manually if you are copying and pasting, encapsulating double with single quotes. If you are on a different system try to escape < also, with \ (backslash). Awesome article! Would it be possible to provide files used to create the source scenario (test.php and xss.gif)? Thanks! Thanks. The test.php file is the same as the online version at http://brutelogic.com.br/webgun/test.php?p=reflection with the simple < ?php echo $_GET['p'];?> responsible for the reflected part. The xss.gif file has the content given in the post (the GIF89a payload). Is there any way you know to make this work when the image is displayed as background in a CSS rule? I couldn’t get it right in this context, and I couldn’t find any change to make these attacks work. Thank you for this great article anyway! Thanks. Unfortunately this is not possible, except for old IE versions. Very first thing I am glad to read your blogs, You’re awesome. I have one case where I am unable to convert [File uploading xss only] a self xss to stored xss. I’ve tried almost all possibilities, is there any other stuff to be try..?! Thanks. Basically you need a way to make someone log into your account to get XSSed, after logging out of his/her account if him/her was already authenticated. You can use a simple HTML form to do it, hosted anywhere. This will be my first report if get success but hesitating I am right or wrong. Thx for help in advance. Sure, call me on Twitter. ,with no interaction or loaded is there a trick in that ? Thanks for your interest in my work. I would need a concrete example of what you are talking about but a simple use of an event handler may be enough to trigger inside it. what is the best mitigation for SVG file ? awesome explanation, keep up the good work buddy.